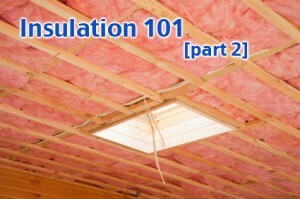 Insulation has come a long way, as we saw in Part One of Insulation 101. In Part Two we’ll show you specific applications for even more types of insulation to help you choose the best option for your Calgary custom homes. In terms of specific applications that you may not have previously considered for Calgary custom homes, let’s talk about Structural Insulated Panels (or SIPs), which use polystyrene sandwiched between plywood as an efficient and effective building system. Seeing that polystyrene’s high R-value ranges between R3.5 and R4 an inch, it resists heat loss so well that it can save 40-50% on energy usage in Calgary custom homes. Also, by building a house using SIPs you will use less wood, which prevents thermal bridging and produces a quieter, more airtight home. From the roof to walls, polystyrene SIPs provide Calgary custom homes with thermal resistance and add structural integrity to walls. Using Type I and II (expanded) polystyrene or EPS provides you with very tight construction and almost no thermal bridging in your walls and roof systems, preventing the transfer of heat to the outside. Check out this expanded list of insulation methods including: fiberglass, spray foam, ICF or concrete forms with polystyrene. Usually made from fiberglass, mineral fiber or cotton, batt insulation is the most cost effective and common type of insulation, but it also has the most problems. For instance, it’s easy to get wet, get crushed or compressed, and it often contains gaps. Because batts are fiber based there will always be air movement, so no matter what batt insulation must be combined with a vapor barrier. Even with that addition, though, you may face heat loss through convection inside the wall system. When poor insulators come into contact – like wall studs – the thermal bridging causes another factor in energy loss. Made of polyurethane, polystyrene or XPS (the blue or pink stuff), rigid foam board has high insulating or R value for its relatively narrow thickness. Commonly used under concrete floors, rigid foam boards can also be applied to exterior and interior framed walls, foundation walls or roof. You might consider this in conjunction with or over batt insulation. Consisting of cellulose fiber, fiberglass or mineral fiber, loose fill is often created from recycled material. It’s used to fill wall cavities and for roof insulation, so is good to use in attics where you can create adequate depth. One issue is that it can be easily moved around and can settle over time, losing its insulating value. Spray foam insulation, commonly made of light density polyurethane, gets very rigid and acts as its own vapor barrier. With a better R-value than an open cell, closed cell spray foam can be used in many applications, including under concrete slabs, over concrete walls, and in floor systems and wall systems, but it can also be combined with other insulation. For example, it can be sprayed into the ceiling rafters to provide a air tight ceiling and then topped with blow-in cellulose to create very high insulating values. Typically these concrete forms are made with 2.5″ – 3″ of expanded polystyrene or EPS on both sides. Like building blocks, they are stacked and then filled with concrete. This system is commonly used for foundations but can be used for an entire home. Not only do you get high insulated values from 5″ – 6″ of EPS, but when combined with concrete, this method is also air-tight and sound resistant. Also, the thermal mass characteristics of concrete creates additional resistance to heat transfer, keeping your home cool in the summer and warm in the winter. Some manufactures state an R35 to R40 for these types of applications. We hope this continued overview of insulation is a helpful resource as you plan the next stages in building custom Calgary Homes. Good luck on your build! For any questions, please check in with our helpful staff at Fine Lines Homes. Insulation choices effect many stages of the building process. Read more Below!